This post is just a tiny appetizer from my forthcoming book "1,000+ Online Content Ideas for Your Business". Sign-up to receive news about, and more excerpts from, the book at the bottom of this page. If you want to know how to create a webinar, and how to host a successful online event, then “get your pirate on” and get ready for adventure. A webinar is a live online event where you can present information, interact with the attendees & drive action with special offers. Webinars fit the content marketing model perfectly. Can be recorded and then used in your ongoing content marketing efforts. Achieving the goals at each step is the key to holding a successful webinar. Each step of the webinar process has one or more specific goals and achieving all of them is the key to planning, holding and benefiting from a successful webinar. The webinar process will help guide you to the results you want. Take note: these goals are not set in stone – you should always take your unique business situation into account – but the framework they provide will help guide you to the results you want be those leads, sales, sign-ups or something else entirely. To achieve webinar success, collect the 6 golden keys shown in the infographic below by completing the goals(s) for each step of the process. Remember to have fun because then your webinar attendees will have fun, too! Ready? Then start your hunt for webinar gold! Note: Click the image to view a larger version. (all the links work in the PDF). Each time I write a post, I collect the 10 best reads from around the web and share them with you here. These posts focus on content marketing strategies, tactics, ideas, tips and tricks for small businesses. Consumers Who Receive Marketing Emails Spend 83% More [INFOGRAPHIC]: E-mail marketing can be very effective. This inforgraphic dishes out tips on how to crank-up your open rates and get the most out of your e-mails. Content Marketing for E-Commerce: 3 Great Examples: Real-life case studies – I loves ‘em! When Does Gating Make Sense for Content Marketing? : The battle between user experience/increased content exposure and lead information capture rages on. 5 Insights About the Convergence of Content Marketing and SEO: A peek inside the “SEO vs. Content Marketing” debate. Is content marketing really inbound marketing … or vice versa? Here’s what you need to know. : An excellent look into this oft-asked, rarely answered question. 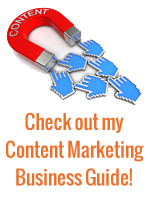 Monrovia GETS Content Marketing: A real content marketing success story! Brevity Is the Soul of Wit and Content Marketing: Good. 20 Resources for Incredible Content Marketing: Good list of resources to check out. Content marketing isn’t rocket science: Handy list of content marketing guidelines that together form a solid framework. Americans More Likely to Share “Funny” Than “Important” Content on Social Media: Well…duh! Still, good to see the numbers.  Matt, Good post and good ideas. I’ve done a couple of webinars by hosting others. The format works because it frees up the presenter to concentrate on the subject while I worry about the technical aspects and answer questions in the chat area. I promoted the webinars in my Linkedin groups but after having been SWAMed I’m at a loss as to where to promote. Can you point me to good places? Glad to hear that you have hosted some webinars! Hope they helped you move closer to your goals! Until they closed it down, I always posted my webinars in LinkedIn’s events area. Other spots I’ve posted at include Facebook events and appropriate sites that appeal to my target customers (e.g. http://www.48days.net lets me post events). I also post regular updates to my social media streams during the two weeks leading up to a webinar. Don’t go crazy and post a ton – you should post at different times each day and try to mix up different update messages, each one highlighting one point of value that folks will get when they attend. Lastly, if you have any co-presenters, make sure they promote the webinar as well, even if you’re the sponsor/host. Best of luck with your future webinars! 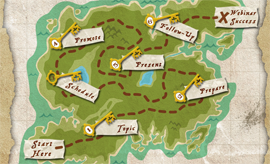 If you want to know how to create a webinar, and how to host a successful online event, then “get your pirate on” and use this treasure map to hunt for webinar gold.